Following World War II, both dynamism and growth characterized AAUW Sacramento. By 1950, the branch had grown to 1,047 members. As it grew, its agenda and activities expanded to reflect the concerns and needs both global and local of the post-war world. Donations of boxes of clothing and food for Europe continued as the post-war reconstruction effort continued. In addition, the branch was donating money to The Stanford Home for Girls, The Sacramento Boys’ Club, The County Hospital, The Children’s Orphanage, and to various projects focusing on mental hygiene and child and family welfare. Committees and interest groups reflected both post-war concerns and the local and personal interests of the members. In addition to groups that still meet today were groups and committees interested in International Relations, The Red Cross and Civil Defense, The Volunteer Service Bureau, Muscular Dystrophy, Motion Pictures and Radio, Child Study, Arts and Crafts (one morning, one evening) Drama, Weaving, Creative Writing, Music Appreciation, Folk Dancing, Gardening—enough committees and groups to satisfy a robust and vibrant membership! By 1950, the 10 members of the Marionette Group (started in 1946-47 as a Drama Group project) had entertained thousands of children with numerous puppet shows. Branch meeting topics reflected the decade’s issues of concern and often featured prominent figures as speakers. Topics such as “Living in the Atomic Age,” “Japan: Bulwark Against Asian Communism,” “The US Looks to the Americas,” “The Red Man in the White Man’s World,” “Whither Higher Education?,” and “Mental Health in a Confused World” suggest both breadth and depth of interest and featured prominent local speakers. Internationally renowned photographer Margaret Bourke-White addressed members at the Jan. 17, 1953, meeting on the topic “Behind the Lenses.” On Oct. 16, 1954, Frank Gibney, news analyst and former editor of Time magazine, was a guest speaker. The AAUW Bulletin (now Capital Ideas) was mailed to members and contained the calendar of events for the month and articles about current activities. The Nov. 1, 1953, bulletin announced that two $150 scholarships had been awarded to graduates of Sacramento Junior College. One winner went on to San Jose State College and the other went to the University of California. 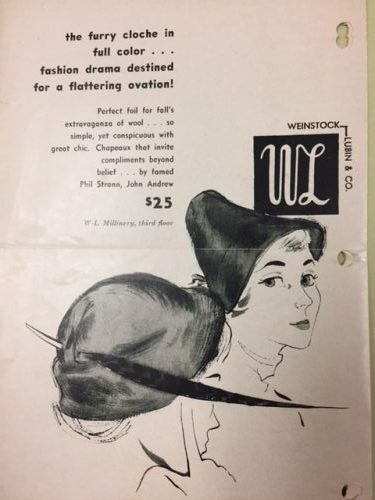 On the back cover of the branch Directory was a full- page ad for Weinstock—Lubin & Co., the department store at K and 12th streets. 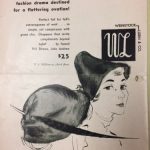 While the ad may seem to present a halcyon picture of the 1950s, clearly AAUW Sacramento also understood that serious problems continued to exist and strove to address them vigorously. This entry was posted in AAUW Sacramento 100th Anniversary, Newsletter on October 30, 2018 by angelascarlett.